The following is an excerpt from Kevin Domino’s “Targeting Your Perfect Motorcycle” presentation at the Progressive International Motorcycle Shows. The Perfect Motorcycle. That’s what we all want. But, if you ask one hundred motorcyclists to tell you what that is, you’ll likely get one hundred different answers. 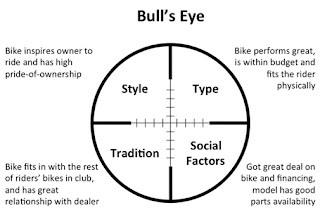 I have developed a process that every motorcyclist can use to target his or her own perfect motorcycle. 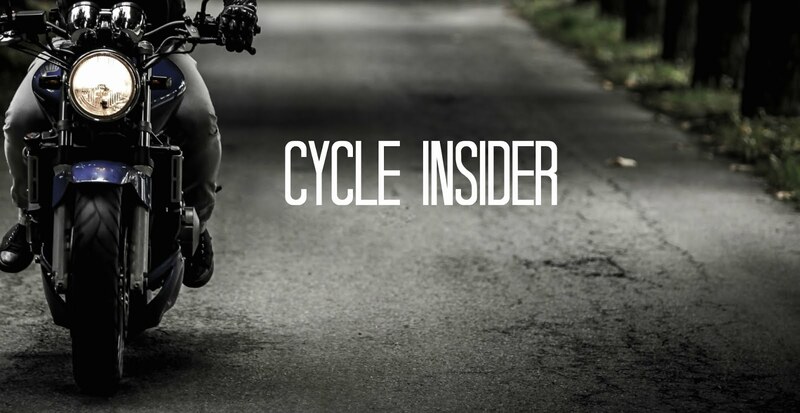 This process will not only help you focus on the right bike, it will save you time and money along the way. The unique nine-step process is described in detail in my book, The Perfect Motorcycle: How to Choose, Find and Buy the Perfect New or Used Bike. 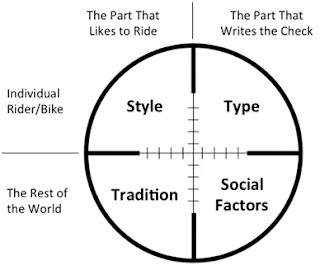 This article will give you an overview and a technique you can use today in your search – a simple-to-use target to determine your perfect motorcycle. When you’re on the hunt for a motorcycle, if you don’t know what you’re aiming at, you’re sure to miss it. To aim accurately, it helps to identify the categories of choices you have and the decisions you will make. The four categories (quadrants of the scope) are Style, Type, Tradition and Social Factors. Every question you need to answer falls into one, and only one, of these quadrants. Only you can answer the questions, but those answers will balance your aim and it will be accurate. 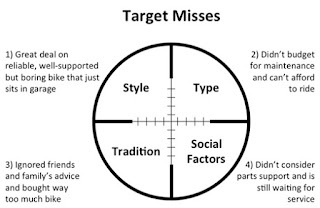 Here are four examples of mistakes that were made because one of the quadrants wasn’t considered. 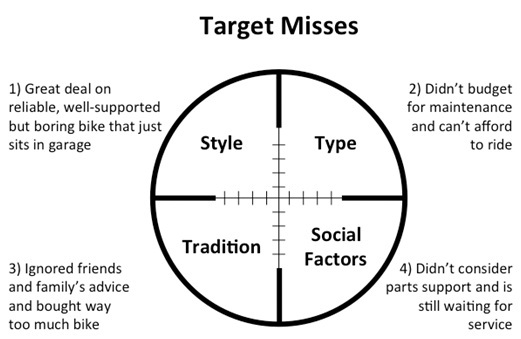 Here is an example of a perfectly targeted decision balancing the answers to all four of the types of questions in the target. I hope you find this concept useful. You can learn more about this and the specifics of the process in my book, The Perfect Motorcycle: How to Choose, Find and Buy the Perfect New or Used Bike. 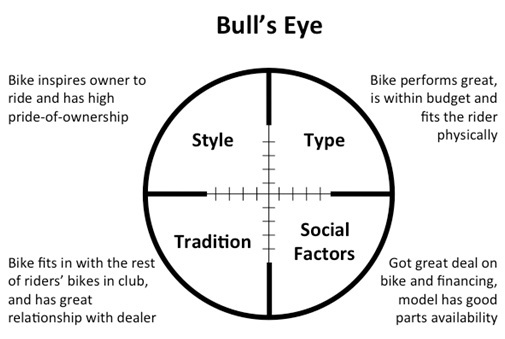 Consider this target and your own unique balance of criteria when you’re on the hunt for your perfect motorcycle. Anyone who is looking for a great deal on a new or used motorcycle should check out www.motorcyclefinderonline.com. We are the #1 place on the web to find a motorcycle. Motorcycle Finder Online Rocks! Great Idea, needed everyday. I work in a bike shop that sells used bikes. Everyday people come in with really no idea what most of the choices are and what they will need in the near future. Then if they make the mistake they loose money getting rid of it or just don't ride it. Thanks from Valley V Twin, Indio, Ca. -- standard mainstream stuff like tires, lubes, etc. Good idea on the method to test for the perfect bike but I think that there is really no perfect bike since different people have different preferences. There are many factors to consider in choosing the right bike that is why people should know what they use it for.